Women spend so much of life nurturing and giving to others that when they find themselves alone—because of an empty nest, the end of a marriage, or the death of a partner—they often struggle with feeling purposeless. The problems of recently-divorced mid-lifers in particular are many. Is there a way to overcome this sense of loss and move toward a life filled with connectedness, fulfillment and happiness? Workshop facilitator and speaker Patti Clark, author ofThis Way Up: Seven Tools for Unleashing Your Creative Self and Transforming Your Life has been dedicated to helping women through various life transitions for more than 20 years. She identifies 7 key actions that women can take right now to move through this sense of loss and toward a life filled with more enthusiasm, creativity, and joy. • Journal – buy a journal you love the feel of and write in it every morning – externalize your internal process. • Play with color – buy some colored pens or pastels and just play with the color, see which colors you are attracted to, don’t judge the outcome, don’t try to draw a stunning picture, just play with color. • Doodle – get some pencils and doodle circles and lines and squiggles; get lost in the process, the end result doesn’t matter. • Garden – play outside. Go get your hands dirty, just dig for a while, plant a small herb garden, plant a flower, play in the dirt. • Dance, move to music. No one to watch you or judge, just listen to a song you like and move, feel the music move through you. • Cook, play with spices. Experiment, don’t follow a recipe, cook with some spices that smell good. • Sew. Don’t try to make anything in particular, just play with putting fabrics together, enjoy the texture and color. • Interrupt your thoughts and patterns when the negative thoughts arise. • Look within for inspiration and support; practice meditation and visualization. • Practice Resilience - Resilience is the rapidity with which we recover from adversity; research shows that meditation improves our capacity for resilience. Focus on recovering – small steps forward every day. • Look at your Outlook - Refers to the ability to see the positive in others, the ability to savor positive experiences, the ability to see another human being as a human being who has innate basic goodness, the ability to say “She means well” and mean it. • Get Outside Garden - play in the dirt and get your hands dirty; spend time on the beach, take a walk in the woods. • Focus on your own needs. Practice saying ‘No’ to others and ‘Yes’ to yourself. • Give your body the nurturing, rest, and comfort it needs. • Prioritize time for yourself, time to do what you love, without judgment that it is a waste of time; and set boundaries to protect the time you have prioritized for yourself. • Don’t keep blaming yourself for past mistakes, learn from them and let them go. • Choose to spend time with people who put your up, not down. • Read books and watch movies that make you feel good about yourself. • Start each day, before you get out of bed, by saying one thing that you are grateful for. • Use Visual Reminders—The two primary obstacles to gratefulness are forgetfulness and a lack of mindful awareness, so visual reminders can serve as cues to trigger thoughts of gratitude. • Remember the Bad—Sometimes it is helpful to remember the hard times that you once experienced and how far you have come. • Thank at least one person a day for something they have done. Practice gratitude consciously. • Call someone once a week to thank them for something kind they have done. • Make a conscious decision to practice gratitude—Research shows that making an oath to perform a behavior increases the likelihood that it will happen. • Instead of hopping on to Facebook, (just a quick peak to see if anyone likes me today)-- UNHOOK – one of the best ways to get back in touch with your self is to give yourself a full day off unhooked. Give yourself a 24 hour no phone, no computer day. Journal, walk, draw, unhook! • Instead of having just one more glass of wine… go for a walk at sunset instead of making 5:00 happy hour with wine, make it a happy half hour walk. • Instead of shoving food - any food – in your mouth … volunteer to feed others. Practicing volunteering and service helping others is a great way to feel better about yourself. • Instead of shopping, (one more pair of shoes will make me feel better) . . . take time to decide where you would really like to help the world, what problem touches you deeply, then donate that money to a good cause that will serve toward a solution that you will feel good about. • Instead of getting insanely busy doing anything else but sitting still… just sit still and breathe. Time yourself – give yourself 10 minutes to watch clouds go by; to watch a sunset; or watch flames in a fire. • Even exercise can be a way to avoid getting to know ourselves better… Instead of going out for another run, try sitting quietly and just breathing, and when the urge to jump up feels overwhelming, take another deep breath and just sit and feel where the discomfort is and sit through it. • Allow yourself 10-15 minutes a day (longer is better) to get lost in the flow of something – doodling, playing an instrument, playing with clay, coloring (Zen Adult Coloring Books are great for this) – in this flow time inspiration often comes. • Get quiet, look within for 10 minutes a day. This doesn’t have to be hard – it can be done by walking in nature, by sitting quietly watching a sunset, watching flames in a fire, or just closing your eyes and breathing. • Ask yourself a question that you want guidance on then go for a walk and pay attention – perhaps you’ll meet someone on your walk or you’ll see something that gives you a flash of inspiration. • Start every morning with an intention. Set the intention deliberately and then pay attention to anything during the day that happens around that intention. • Take action on any inspiration that comes. Learn to trust that small, still voice and then act on it. The more you listen for your inspiration and take action on it, the more you will trust it and it will become easier to take action on. • Journal about any inspiration and action that you took before you go to bed. Ask for any guidance before you go to sleep. Journal in the morning about any insights from dreams or interesting thoughts upon waking. Patti Clark is an accomplished speaker and workshop leader dedicated to helping people through various life transitions on their journey to an extraordinary life. 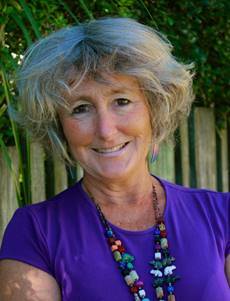 For more than 30 years, and over several continents, Patti has been sharing her knowledge and wisdom with others. Her new book, This Way Up, is her latest endeavor. She is a native of the San Francisco Bay Area, has a B.A. in Social Sciences from U.C. Berkeley and an M.A. in Education. She has taught English at several universities around the U.S., most recently at the University of Wisconsin, Madison. Patti now travels around the globe facilitating workshops, and is about to launch a new series of interactive workshops online. Patti spends part of her time in the United States, and part of her time in New Zealand. She and her husband and their two sons live near the beach on the Coromandel Peninsula. 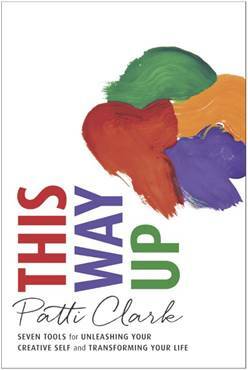 "This Way Up is a healing guide to a more fulfilling life. Chock-full of practical tools, practices and reflection questions, it’s a helpful and relatable book for readers wanting to deepen self-insight, release the obstacles and doubts that hold them back, and find the courage to claim the life they yearn for and deserve."